A band called Riff Raff, an album titled Hullabaloo; it's a fair bet that a rowdy collection of delinquents is about to create a raucous musical racket. The bet would be lost, however, as both band name and album title misdirect. Hullabaloo is a collection of free-flowing, often meditative tunes written by bassist/bandleader Dave Manington and performed by a sextet that harnesses its creative energies in the service of these compositions. Manington is a founder member of London's Loop and e17 Collectives. His band mates are also key figures on the UK jazz scene and the seemingly easy interactions which the members of Riff Raff display here is an indication of their expertise and of their experience as a unit. 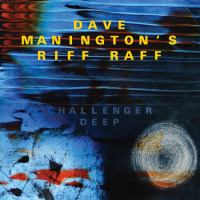 Although he's the leader and composer, Manington stays mostly in the background, establishing the music's center (although there's a slinky solo from him on "Not A Worthless Thing"); instead, it's saxophonist Tomas Challenger, vocalist Brigitte Bereha and keyboardist Ivo Neame who form the musical front line, imprinting their own distinctive personalities on the music. The tunes benefit from the range of instruments Manington has at his disposal, especially Neame's range of keyboards and the soft, warm sounds created by guitarist Rob Updegraff. Neame also shows off his accordion skills, with both "Agile" and "You Can't Eat Crisps To That" building on his funky grooves. "Water Torture" is named after Neame's short, repetitive keyboard phrase which opens the tune. It soon opens out to become a rolling, mid-tempo number whose overall feel is much more fluid than it is tortuous. Bereha's wordless vocal is central to this sense of movement and her love of harmonizing with Challenger's tenor finds its most effective expression on this tune. Challenger's tenor playing is exemplary, whether improvising a jagged, frenetic solo on "Agile" or adding drama and tension to "Pedro Bernardo." On "Catch Me The Moon," "Pedro Bernardo" and "Not A Worthless Thing," Bereha sings her own lyrics. Her voice has a plaintive beauty and, at the upper reaches of her range, a fragile quality that connects with the lyrics' emotions. All three songs feature outstanding playing, making the instrumental/vocal interaction highlights of this fine album. Track Listing: Agile; Hullabaloo; Lingering At The Gravy; Catch Me At The Moon; Water Torture; Pedro Bernardo; You Can't Eat Crisps To That; Not A Worthless Thing. Personnel: Tom Challenger: tenor saxophone; Ivo Neame: piano, Fender Rhodes, keyboards, accordion; Rob Updegraff: guitar; Dave Manington: double bass; Tim Giles: drums, percussion; Brigitte Bereha: vocals.